Can you identify where in London this picture was taken (and what it represents)? If you think you can, leave a comment below. We’ll reveal the answer early next week. Good luck! 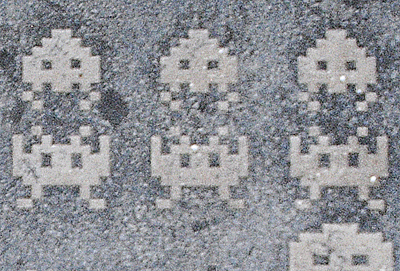 These space invaders are located on the ground at the entrance to St Dunstan’s Court, just off the north side of Fleet Street. The plaque commemorates the role new computer technologies played in the demise of the traditional Fleet Street printing process. It’s one of a series of eight plaques referring to aspects of the printing industry located at the entrance to courts. Oh, the Space Invaders, you used to see those guys everywhere– there’s loads in Paris and Brussels, as well, though I don’t know where this set is.